UK high street bank Barclays is no longer listed as a shareholder in Elbit Systems, the major Israeli military company that manufactures drones used in Israel's attacks on Palestinians and helps Israel build its illegal Apartheid wall. It recently came to light that Barclays is no longer a listed shareholder of Elbit. However, Barclays is yet to make a public commitment that it won't own shares in Elbit in the future and still holds shares in other arms companies that supply Israel. "The fact that Barclays is no longer listed as a shareholder in Elbit Systems is a welcome development. Elbit plays a key role in Israel's brutal massacres of Palestinians and in the proliferation of drone technology across the world, and is helping Israel to construct and maintain its illegal apartheid Wall." "The creative campaign against Barclays, including the huge Avaaz petition and the occupations of its branches, has really tuned the heat up on the bank." 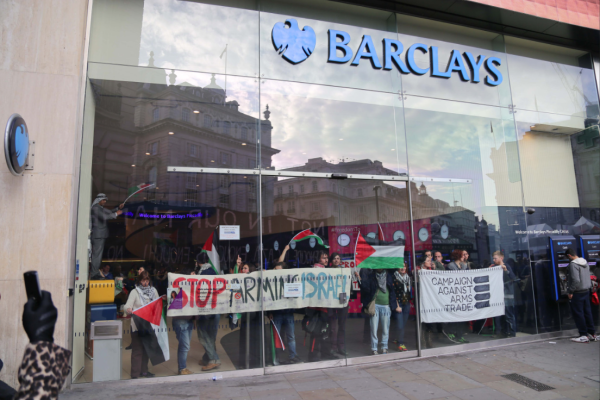 "We hope that Barclays will now commit to not allowing clients to buy or sell Elbit shares on its platform and to making it clear to all its clients that Elbit is deeply complicit with Israeli violations of international law." "We call on Barclays to sell its shares in all other arms companies that supply the Israeli military, including Raytheon and BAE Systems."